Correfocs originate from a form of medieval street theatre called ‘Ball de Diables’, representing the fight of good against evil. According to Joan Amades,an outstanding ethnologist and Catalan folklorist, in 1150, at the wedding banquet of the Compte de Barcelona, Berenguer IV with Princess Peronella, daughter of the King of Aragon and Catalonia. 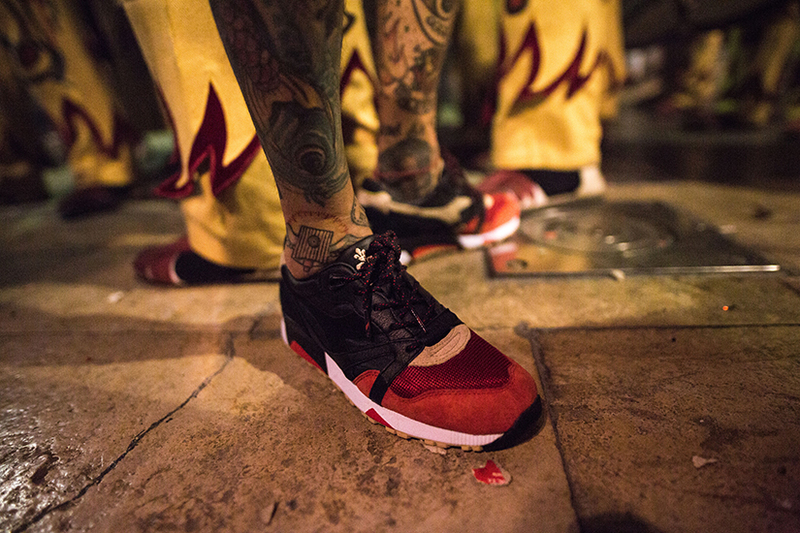 The first action that we have documented, of a Colla de Diables took place. Hundreds of years later,during the dictatorship,Spanish dictator Franco banned many aspects of Catalan culture, so after his death, Barcelona wanted to fill the streets once again with fire and festivity. Correfocs ,literally in English "fire-runs" are among the most striking features present in Catalan festivals, makes sure that any festival goes with a bang! In the correfoc, a group of ‘colles de diables’ (groups of ‘devils’) dressed in red and black as devils , wearing horns and masks and light fireworks - fixed on devil's pitchforks or strung above the route. Dancing to the sound of a rhythmic drum group, they set off their fireworks among crowds of spectators. The spectators that participate dress to protect themselves against small burns, like with straw hats and cottonbandanasand attempt to get as close as possible to the devils... running with the fire. The LimitEditions x Diadora N9000 “Correfocs” is limited to 400 pairs and is releasing soon at LimitEditions.